Behold the power of Vroom! Now, far be for me to accept complete responsibility for Taymor and co.’s wise decision—humility prevents me from doing so—but how could the visionary not take into serious consideration the comments of one who spent a decade portraying the iconic Web-Slinging Idol of Millions? Make The Green Goblin and a slightly revised Sinister Six the main antagonists—I hadn’t mentioned Gobby’s Act II return in my review, because he only appeared on screen, a pathetic misuse of your great vision of the character, wonderfully portrayed by Patrick Page. Dump the ill-advised Swiss Miss and have the Goblin return as the leader of the Sinister Six. Currently, Spider-Man’s arch-nemesis and cabal of evildoers prove to be nothing more than illusions conjured up by Arachne. Make ’em real and stage a clever final showdown pitting our intrepid arachnid against the combined forces of evil. Keep Arachne a spiritual manipulator—I like the use of the Arachne mythos as you juxtapose it with Spider-Man’s. But the character loses her integrity when you make her a physical threat. Cut the insulting, campy “shoe” number and make Arachne more of an observer in the same vein as the gods in the classic Ray Harryhausen film, Jason and the Argonauts. Spidey’s ultimate triumph can also serve to finally teach Arachne humility after thousands of years in limbo and her attempt at regaining a mortal foothold through Peter Parker. This result would further elevate the Web-Slinger as hero. 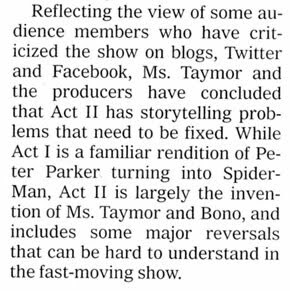 I want nothing more than for Ms. Taymor and co. to succeed. After all, there is nothing more heroic than turning seeming defeat into triumph. So Spider-Man has spoken, so shall it be done! Sounds like Spidey's web broke and he fell nearly 30 feet. Ouch. This musical might be doomed. Hey Vroom? Did they send Green Goblin after you after your review? Hope you're okay. I am fine, but I have been extremely busy of late. This is great when one is freelancing, but it does mean that extracurricular activities must be put on hold, i.e. HeroesInMyCloset.com. But I have been collecting material and piecing some things together, so I hope to be back with a new posting soon. I hope you are well and your studies are proceeding accordingly. Good to hear from you! My studies are going well. They are getting intense however. Kinesiology and clinical pathology is a mind bender. Can't wait for neurology! Looking forward for more of your blogging in my down time. Thank you for the king remarks. When I answered Bloglodyte John in the previous comment, I had fully intended on reposting by now. However, it appears HIMC shall arise soon.